Another heart used from the Tando ' Home hanging chipboard set'....this time to create a decoration for my Christmas tree. I covered the heart in this gorgeous Crafty Individuals Christmas paper and added some hand cut wings covered in the same. I used a tube of 3d glitter glue to add around the edges and also a little snowflake charm and clear gem for a little bit of luxury. 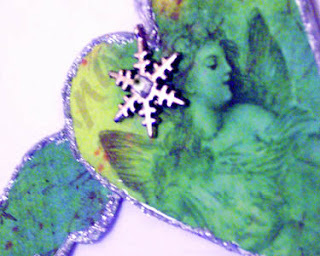 A really easy project but something I can keep in my decorations box to use for lots of years to come. This is really beautiful, the detail is lovely. 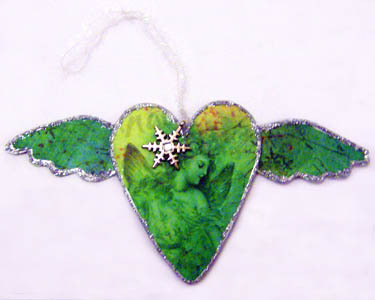 Oh Chris a special and very wonderful heart, love the colors and the wings, great work, wish you a nice christmas time. Gorgeous! I just love the colors, so pretty! SO many lovely things to see and catch up on dear Chris!